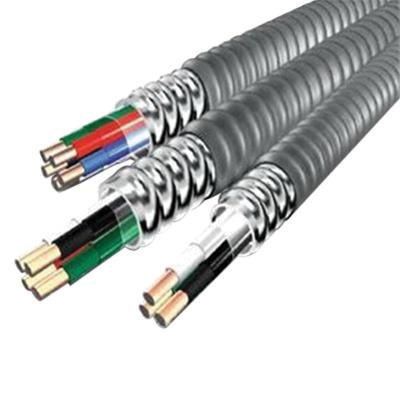 8/4 MC armored cable features PVC jacket and THHN/THWN insulation to safeguard against sunlight, UV and electrical hazards. This copper cable has voltage rating of 600-Volts and current rating of 40-Amps at 60 deg C/50-Amps at 75 deg C/55-Amps at 90 deg C. Aluminum armored cable withstands temperature rating of 90 deg C in dry conditions. This 1000-ft cable comes in master reel. Cable withstands temperature of 90 deg C dry/75 deg C wet. It is perfect for branch, feeder and service power distribution in commercial, industrial, institutional and multi-residential buildings. Cable is UL listed, REACH/RoHS-2 compliant and VW-1 rated.